Where the Stars of Tomorrow Shine Tonight! BOURNE, Mass. -- A local New Englander has been recognized for an outstanding season and also for what promises to be an exciting future in baseball. That player is Bourne Braves third baseman Willy Yahn. 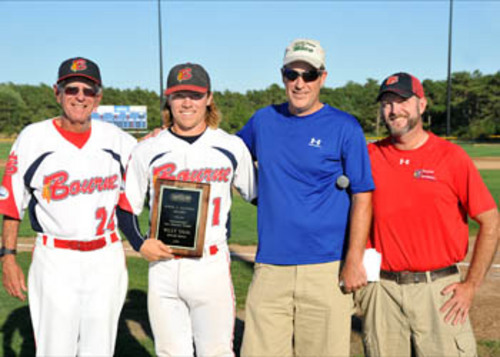 The University of Connecticut product was presented with the John Claffey New England Top Prospect Award, given to an outstanding player that either attends college in New England, or is a native New Englander. Yahn is a rising junior and before coming to Cape Cod, was one of the best players in American Athletic Conference. He hit .319, three home runs and 46 RBI. A long list of accolades also have been a big part of his college career, as he was an American Athletic Conference First Team member, was named to the ABCA/Rawlings All-Northeast Second Team, was one of two Huskies to start in all 63 games, and led the AAC with 88 total hits and ranked among the top-10 in batting average, runs (48), doubles (20) and RBIs. In 2015, he was a Louisville Slugger Freshmen All-America. Yahn was named to the CCBLWestern Division all-star team. The Braves third baseman represented well, as he went 1-3 with an RBI. His season with Bourne also showed promise, as he batted .290 with 13 RBI. Yahn tied for third in the league in hits (51) and second in the league in runs scored (29), as he was Bourne’s primary lead-off hitter for majority of the season. 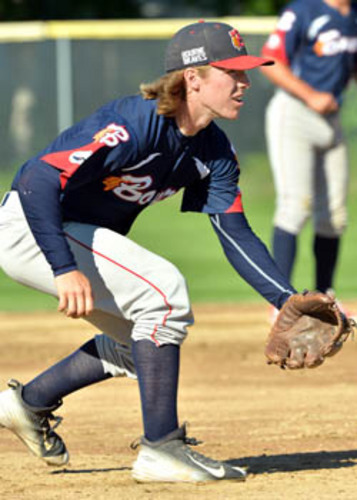 The UConn product looks to propel Bourne for what Yahn hopes will be a long playoff run, as the Braves face the Wareham Gatemen in the first round. Yahn has been with Bourne since day one, playing all 44 games. He’s the only Cape League player to play the full 44-game schedule, and that shouldn’t change when playoffs start. © 2019 Cape Cod Baseball. All rights reserved. General Information: info@CapeCodBaseball.org This material can not be published, broadcast, rewritten or distributed without prior written consent.